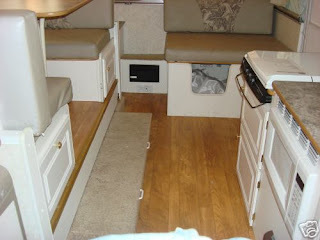 This is an idea I have for my RV. Yes i am working to restore my old RV that need it. I was thinking wood flooring and white walls with blue fabric. So i dont know if i want whe is in the pic or whats on my mind. LOVE the white and the wood. I like how they have the tan or gray fabric.